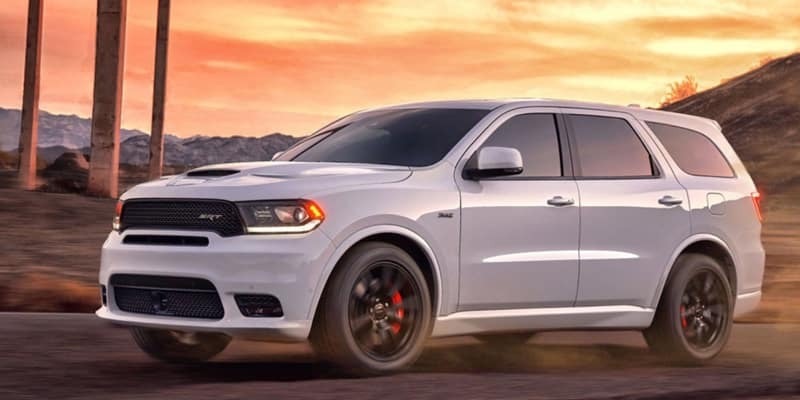 The 2019 Dodge Durango puts the sport back into sports utility vehicle. This is a family car that seats up to seven people in comfort, but it has a true muscle car heritage. With a choice of powerful engines, the Durango will leave other SUVs way behind. Five trim levels, the option of two- or four-wheel drive, and a range of optional interior and exterior packages mean you can personalize your Durango just the way you want it. Available trim levels are SXT, GT, Citadel, R/T, and SRT. The SXT and GT feature a colored grille with chrome details, chrome bodyside insert, rear lip spoiler, body color bumpers and door handles, power folding heated door mirrors, fog lights, and fully automatic headlights. The R/T adds a power liftgate and side mirrors with integrated turn signals, while the Citadel has a chrome grille and door handles and a roof rack. The top-of-the-line SRT has a unique body-colored grille and a performance hood with air intake and dual heat extractors. The standard engine in SXT, GT, and Citadel models is a 3.6-liter V-6 producing 293 horsepower and 260 pound-feet of torque through an eight-speed automatic transmission. The R/T has a 360 horsepower 5.7-liter V-8 engine, which produces 390 pound-feet of torque. In the SRT is a 475 horsepower 6.4-liter V-8 that can pump out 470 pound-feet of torque. The V-6 goes from zero to 60 in 8.1 seconds and returns 21 miles per gallon for combined highway and city driving. The R/T’s 5.7-liter V-8 will go to 60 mph in 6.2 seconds and gets 17 mpg combined. 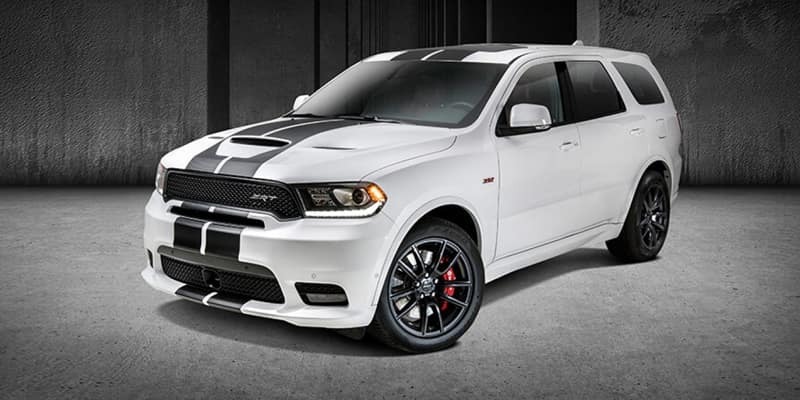 The SRT is all about power, and the 6.4-liter V-8 will get you from a standstill to 60 mph in 4.4 seconds. Depending on the model and seat choices, there are more than 50 ways to configure the seating to maximize passenger and cargo capacity. The SXT seats five people and has cloth upholstery, front bucket seats with a fold flat passenger seat, and 60/40 split folding rear seats. The leather wrapped steering wheel has audio and cruise controls. 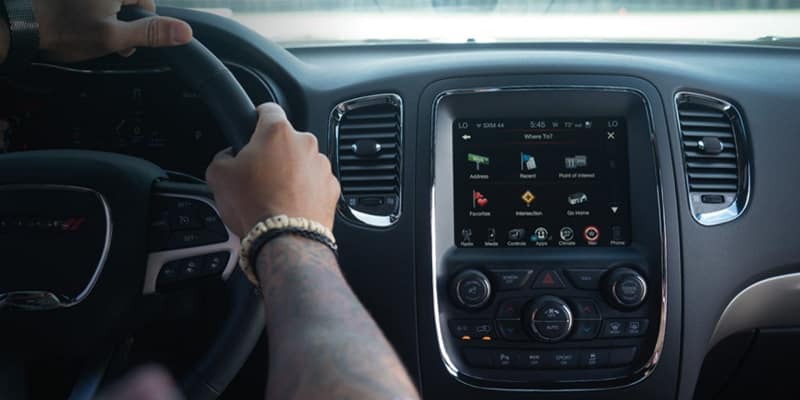 The Uconnect infotainment system features a 7-inch touchscreen, six-speaker voice-activated audio with satellite radio, wireless phone connectivity, and smartphone integration. GT models add electronically folding third row seating and an eight-way power driver’s seat, while the Citadel has leather upholstery with heated front and rear seats, leather door panels with simulated wood inserts, power sunroof, 4G Wi-Fi hotspot, and a nine-speaker Alpine audio system with a 506-watt amplifier. The R/T features simulated suede and leather seats. 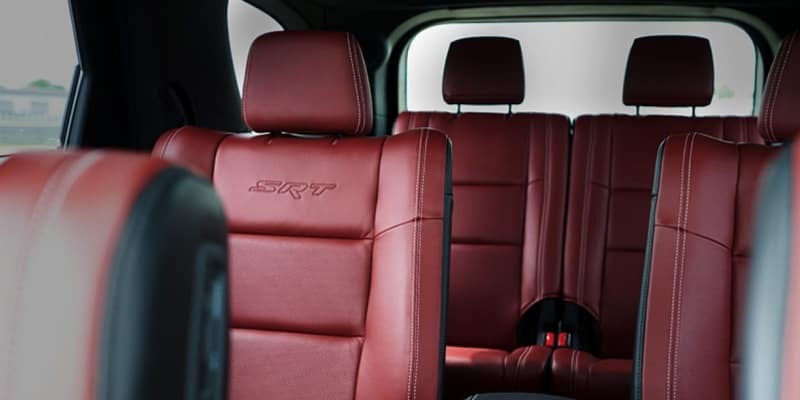 The SRT has leather upholstery with second-row bucket seats. Standard safety equipment includes front, side, knee, and overhead air bags, side-impact bars, traction control and electronic stability control with anti-roll, assisted ABS, and a rear camera. The GT has daytime running lights, auto-dimming rear view mirror, and rear park assist. Citadel adds four-wheel ventilated disc brakes, front park assist, rain sensitive wipers, and high intensity discharge headlamps. 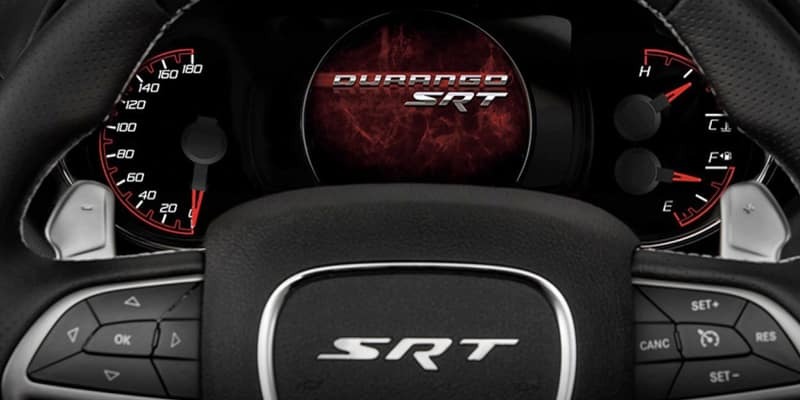 SRT models feature high performance suspension and a Brembo braking system. Now that you’ve gotten acquainted with the 2019 Dodge Durango, experience it for yourself. Just schedule a test drive. * 6 Cylinder engine * * Check out this 2019 Dodge Durango GT * * 2019 ** Dodge * * Durango * This Black Clearcoat 2019 Dodge Durango GT might be just the SUV AWD for you. It has a 6 Cylinder engine. With a charming black clearcoat exterior and a black interior, this vehicle is a top pick. Call and schedule your test drive today! Call Josh Tharp at 317-839-6554 for more information or to start your EAZY DEAL at Westgate By submitting an inquiry on this vehicle you are agreeing and consenting to our dealership contacting you by telephone, text messaging or other means concerning your inquiry, potential vehicle sale or promotional offerings by our dealership and other information. By participating, you consent to receive recurring text messages sent through an automatic telephone dialing system. Message and data rates m. Contact Information: Westgate Chrysler, 2695 East Main Street, Plainfield, IN, 46168, Phone: (317) 839-6554, E-mail: jtharp@westgateauto.com. * 8 Cylinder engine * * Check out this 2019 Dodge Durango R/T * * 2019 ** Dodge * * Durango * This Black Clearcoat 2019 Dodge Durango R/T might be just the SUV AWD for you. It has a 8 Cylinder engine. Rocking a ravishing black exterior and a black interior, this car is a sight to see from the inside out. Good cars sell fast! Give us a call and schedule an appointment today! Call Josh Tharp at 317-839-6554 for more information or to start your EAZY DEAL at Westgate By submitting an inquiry on this vehicle you are agreeing and consenting to our dealership contacting you by telephone, text messaging or other means concerning your inquiry, potential vehicle sale or promotional offerings by our dealership and other information. By participating, you consent to receive recurring text messages sent through an automatic telephone dialing system. Message and data rates m. Contact Information: Westgate Chrysler, 2695 East Main Street, Plainfield, IN, 46168, Phone: (317) 839-6554, E-mail: jtharp@westgateauto.com. * 8 Cylinder engine * * Check out this 2019 Dodge Durango R/T * * 2019 ** Dodge * * Durango * This Red Line 2019 Dodge Durango R/T might be just the SUV AWD for you. It comes with a 8 Cylinder engine. Flaunting a suave red exterior and a black interior, this car is a sight to see from the inside out. Interested? Call today and take it for a spin! Call Josh Tharp at 317-839-6554 for more information or to start your EAZY DEAL at Westgate By submitting an inquiry on this vehicle you are agreeing and consenting to our dealership contacting you by telephone, text messaging or other means concerning your inquiry, potential vehicle sale or promotional offerings by our dealership and other information. By participating, you consent to receive recurring text messages sent through an automatic telephone dialing system. Message and data rates m. Contact Information: Westgate Chrysler, 2695 East Main Street, Plainfield, IN, 46168, Phone: (317) 839-6554, E-mail: jtharp@westgateauto.com.